High-availability Seamless Redundancy (HSR, IEC 62439-3-Clause 5) provides redundancy by sending packets in both directions through a ring network. 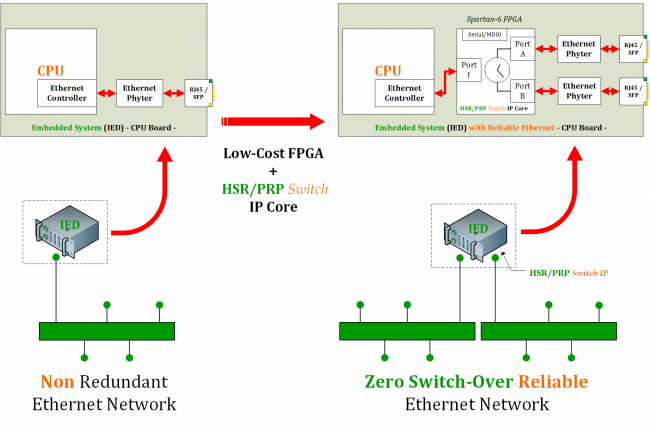 A simple HSR network consists of Doubly Attached Bridging Nodes, each having two Ethernet ports. A HSR node sends the same frame over both ports. A HSR capable destination node receives, in fault-free state, two identical frames over both ports respectively within a certain interval. The first received frame is accepted while the duplicate is discarded. In case of an interruption in the ring, the frame will always be received through the other port. HSR offers “zero-recovery” time in case of failure of one component. Thus, high availability and very short reaction time. The end-node works as a switch, so the space and cost saving can be meaningful.